Another halo taken during the early evening of February 8th 2008 before sunset. Facing SW from Willow Glynn, Maghera. This was taken from my front garden using a tall plant to block the Sun which was quite bright at the time despite the murky sky. 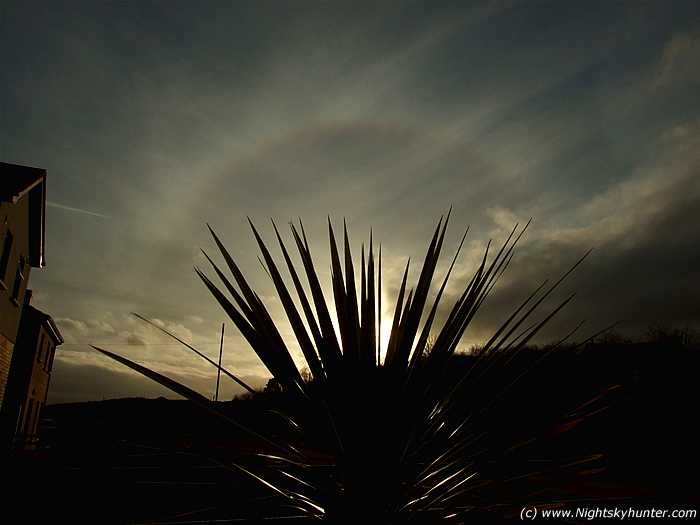 Well formed bright Sun halo with strong colours and nice cirrus streaks aloft blown strongly by high altitude winds (it was calm at ground level - there's no shaking of the leaves on the plant). Perhaps the jet stream was near by. Passenger plane can be seen to upper left moving away from the Sun. This was the last I seen of any halos today as the cloud quickly thickened to dark overcast. The weather in N. Ireland sure is unpredictable but that's why I like it. ISO100, 1600/second shutter speed at 28mm.